A bowl of collard greens. Collard greens are a leafy green vegetable that is related to kale. Collards are high in fiber and vitamins A and C. Because leafy greens like collards are high in calcium, they are an important food for people who don’t eat dairy products. They are also a staple of Southern cooking. They are frequently cooked slowly, which makes them perfect to cook in a slow cooker. This leaves your stove top free for cooking other dishes. Place the ham hock in your slow cooker and add enough water that it comes about a third of the way up the side of the cooker. Cook the ham hock on low for two hours, or until it is hot and the water has taken on the flavor of the ham. Wash the collard greens thoroughly. 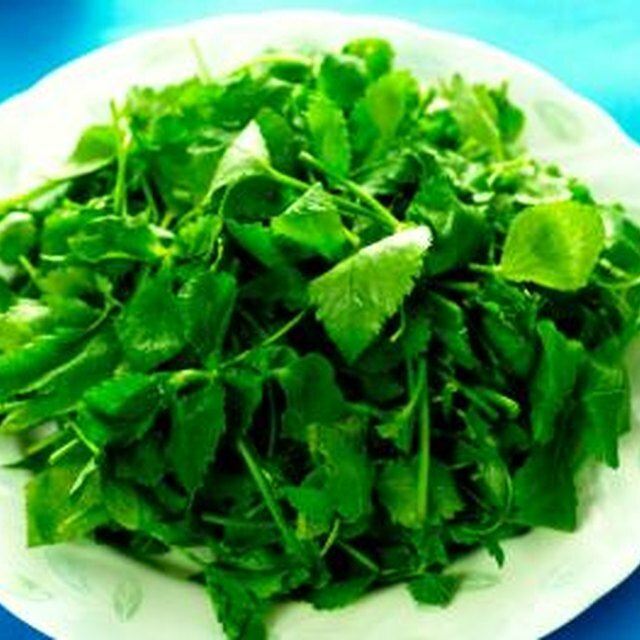 Using a sharp knife, remove the stems from the leaves and discard them. Chop the leaves into 2-inch pieces. Add the collard greens to the water a handful at a time, allowing them to wilt slightly so the entire pound of collards fits into the slow cooker. Continue cooking on low for four to six hours, or until the greens are as tender as you like them to be. Drain and season with salt and pepper to your taste. Reserve the cooking liquid from your greens. If you find they are a little dry after draining, add 1/2 cup of the liquid back in. The ham hock can be replaced with a variety of other flavorful proteins. Bacon or a smoked turkey leg are two popular choices. There are many seasoning additions that you can use when cooking collard greens. Diced onions, hot sauce, vinegar and even salsa can be added to the pot to give a different flavor.